Today’s small, compact multi-function electronic controls, variable speed drives, servos and programmable logic controllers are extremely sensitive to heat and contamination. Smaller cabinet sizes make temperature control difficult and prone to premature failures. Excessive heat will cause digital displays to misread, controls to drift, and breakers to trip below rated loads. The result is productivity lost due to machine or line shutdowns. Vortex Enclosure Coolers maintain a slight pressurization in the cabinet to keep electrical and electronic components clean and dry; and most are thermostatically controlled to maintain enclosure temperatures within a specified temperature range. Vortex Coolers are an affordable, low maintenance, and easy to install alternative for thermal management of electrical cabinets and control panels. 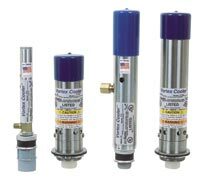 Using filtered compressed air and vortex tube technology, Vortex Coolers provide cooling capacities to 5000 BTUH and maintain NEMA 4 , NEMA 4X andNEMA 12 ratings. Today’s small and compact, multi-function electronic controls, variable speed drives, servos and programmable logic controllers are extremely sensitive to heat and contamination. Excessive heat causes components to “cook”, digital displays to misread, controls to drift, and breakers to trip below their rated loads. The result is often lost productivity from machine or line shutdowns. ITW Vortec’s Vortex Cooler Enclosure Coolers are the low maintenance alternative for keeping enclosures cool and clean — without refrigerants. Fans often provide inadequate cooling and commonly pull in dirty humid air creating another source of failure. Air conditioners require ongoing maintenance and are relatively expensive, large and difficult to install. 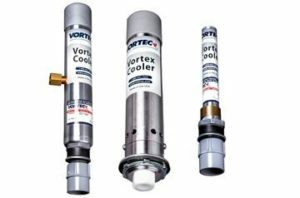 With no moving parts to wear out, Vortex Coolers use an internal vortex tube to convert factory compressed air into a low pressure, cold air stream that is distributed throughout the cabinet. The chilled air stream creates a slight positive pressure inside the enclosure to prevent dirt or dust from entering – even in the most challenging environments. From small computer cabinets and touch screen control panels to large electrical panel boxes, Vortex Coolers offer efficient and reliable enclosure protection from heat and dirt related shutdowns. Vortec’s Enclosure Cooling Systems eliminate nuisance tripping and production downtime caused by failure of overheated or dirty process controls and electronics. Fans pulling in dirty, humid air only accelerate the problem. become inaccurate and solid state components are cooked from overheating. Most electronic control systems generate a lot of heat during operation. As electronic controls are made more compact, perform more functions and are placed in confined enclosures, this heat factor is intensified. Additional problems are encountered when the electronic process control system is located on-line in a factory environment, rather than a clean computer room. The factory setting can be hostile to the point that performance and effective life of the electronic components are materially reduced, or the control system completely fails. A Vortex Enclosure Cooler converts factory compressed air into filtered, cooled air without electricity or refrigerant. Easily mounted in a standard electrical knockout, a Vortex Enclosure Cooler can quickly be connected to an air line for an immediate supply of cool, clean air with no RF interference. 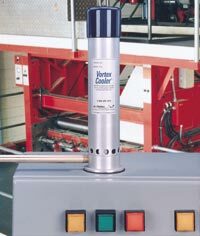 Vortex Enclosure Coolers use a Vortex Tube to convert compressed air into two air streams, one hot and one cold. The cold air is discharged into the enclosure. The hot air is discharged into the atmosphere. The hot air in the enclosure is vented outside through a relief valve on the Vortex Enclosure Cooler. The relief valve and seal on a Vortex Enclosure Cooler are designed to maintain the sealed nature of the NEMA or JIC boxes. The only air introduced into the cabinet is filtered before it enters the Vortex Cooler. Vortex Enclosure Coolers maintain approximately 6” W.C. positive pressure inside the control cabinet.